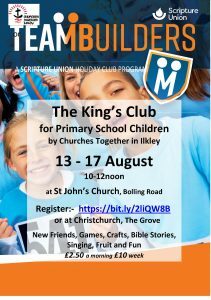 All primary school children are welcome to join us at St John’s Church, Bolling Road for the annual summer holiday King’s Club! It’s a fantastic week where children can make new friends, learn more about the bible and have lots of fun! The club will run from Monday 13th August – Friday 17th August, 10am – 12noon. If you would like your child to come along, please fill out the registration form here.